PARIS, Dec 9 (Reuters Life!) - Champagne makers are hoping to hear the sound of corks popping this festive season to drown the gloom of a year that has seen sales volumes drop as a global economic downturn bites. Champagne sales were down 4.9 percent in the first 10 months of the year and in October alone sales volumes fell 16.5 percent to 36.2 million bottles, according to data from the CIVC industry body. This is the first fall in the Champagne market since 2000, though that comparison was distorted by high sales from the previous year when customers stocked up to celebrate the new millennium. Last year sales volumes rose almost 6 percent to a record 430 million bottles, worth 4.6 billion euros ($5.9 billion) in revenue. "Without being truly worried, the profession is tense," said CIVC spokesman Daniel Lorson, adding that price rises should still push annual turnover higher. "End of year sales can come through very late," he said. "The psychological element will be key. Today, it is very hard to make predictions, given the lack of visibility and an element of irrationality that is not negligible." October saw Champagne sales in France, which accounts for 55 percent of the total, drop 11.7 percent for a 10-month decline of 5 percent. In the European Union, an 18.6 percent fall in October led sales 4.5 percent lower in January to October. Britain, which accounts for one in four exported bottles, also experienced an appreciable decline, CIVC said. Elsewhere, sales plunged by a quarter in October, mostly led by the United States, CIVC said, though sales were largely stable in Japan. Growers were less affected than Champagne houses and cooperatives as they were in direct contact with their customers and less dependent on intermediaries, the industry body said. "Intermediaries are sensitive to the cost of credit and the financing of stocks," Lorson said. "They are very cautious and don't dare commit to significant stocks." 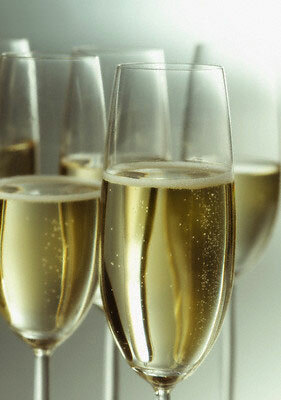 There are some 100 Champagne houses, accounting for about 70 percent of total sales and 90 percent of exports. Luxury group LVMH boasts the Moet & Chandon, Dom Perignon, Veuve Clicquot, Krug, Mercier and Ruinart brands. World number two wines and spirits group Pernod-Ricard counts Mumm and Perrier-Jouet amongst its brands, whilst Remy-Cointreau owns Piper-Heidsieck and Charles Heidsieck. In a recent move to boost year-end sales and inject life into the U.S. market, Moet & Chandon announced in New York on Monday that customers could order bottles personalised with messages in Swarovski crystal, a service it said was previously only open to A-list celebrities and VIPs. And the recent annual Millionaire Fair in Moscow saw $60,000 Champagne coolers for yachts being snapped up, according to its organisers.